When considering powerhouses of colonization, most do not rank Norway among the likes of England and France. However, this country did have numerous outposts and much influence in Africa and Oceania. 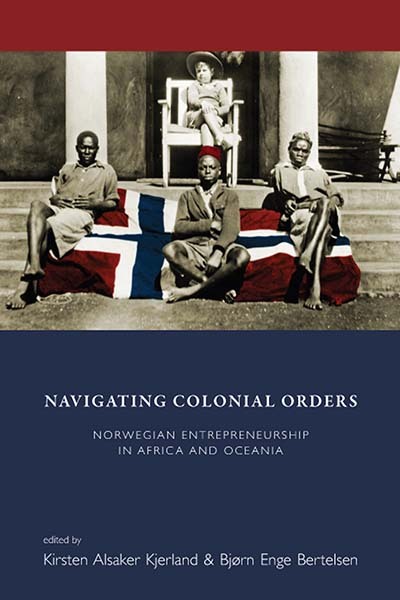 These territories come into focus in Navigating Colonial Orders: Norwegian Entrepreneurship in Africa and Oceania, which was published this month. Following, editors Kirsten Alsaker Kjerland and Bjørn Enge Bertelsen share insights into their book. What drew you to the study of the entrepreneurial efforts of Norwegians in colonial Africa and Oceania? How was Norway’s involvement different from its counterparts in the rest of Europe at the time? How were they the same? When looking at classical representations of colonial Africa, Oceania or, also, Latin America, one is struck by how the large colonizing countries have monopolized history. What struck us when starting to follow Norwegians that went abroad in the late 1800s and early 1900s was that this was simply not the case: The various colonial settings that we have examined have uncovered great diversity in terms of non-indigenous inhabitants and, thus, revealed different forms of colonial dynamics than what has often been contained in colonial histories of the major countries. Put differently, the same contexts that one knew from the national histories of the European major colonial powers where colonizers often were cast as British, French, Portuguese or German, simply did not ring true on closer examination: These were heterogeneous settings also in terms of nationalities and interests — including those of Norwegians. That said, the way in which Norwegians of many hues and trades engaged colonial settings as varied as, for instance, Hawaii and Mozambique varied greatly. So, while some of the contributions to our volume indicate that, perhaps, some Norwegians in certain settings seemed to create less tension with local inhabitants than would others — or were less directly involved with various colonial projects, yet other chapters indicate that Norwegians were embedded in actual processes of colonial pacification, colonial nation-building or part of the colonial administration. What may be said, however, is that as coming from a country without colonies in Africa or Oceania — although there were colonial desires also driving Norwegian politics at times — Norwegians in many contexts aimed to carve a position for themselves as go-betweens between hard categories. Put another way: many Norwegians assumed the role of tricksters that aimed to evade being tied to specific colonial projects in order to capitalize on their in-between or ambivalent identity. Did any perceptions on the subject change from the time you started your research/compiled the contributions to the time you completed the volume? Yes, indeed! At the outset of the research that this book is the result of, many of us had the impression that the numbers of Norwegians involved in these places were quite limited. Subsequently, it was easy to make the assumption that their political, social, cultural or economic influence over their circumstances was little. In many of the chapters in the book, this is shown not to be the case: Norwegians were, in some places such as King Leopold’s Congo or in the late 1800s Solomon Islands, quite disproportionally influential as well as numerous. This is, of course, not to say that groups or individual Norwegians should be accorded a major role in colonialism as such but to point out that they — along with other noncolonial colonials — make up crucial components of the colonial orders. What also became increasingly clear through the research was that Norwegians, perhaps more than people from other countries, tended to be close to water and to ply their trade in direct or indirect connection with this: Being involved in whaling, shipping of colonial produce, inter-island petty trade, river transportation of goods and people, ethnographic and military expeditions, Norwegian colonial history is crucially also maritime history. And for the case of Norwegian history of the sea that is often represented as one of fisheries, migration and, more lately, marine petroleum exploration, this book has now contributed to expand such a seaborne orientation to also include a wide variety of maritime colonial ventures. This also led us to coin the title of the book in terms of navigation which is here meant both literally and metaphorically. Do you think there are aspects of this work that will be controversial to other scholars working in the field? Yes. The fact that we provide such a solid case for Norwegian colonial complicity – widely conceived – may be controversial, at least given a dominant discourse in Norway about the country’s non-colonial past. In underlining the many ways in which Norwegians were what we call ‘noncolonial colonials’ the book attempts to contribute to, perhaps, an emerging trend of historical inquiry that also maps smaller country’s multifarious involvement with the colonial world. There is also a crucial critical edge to this beyond challenging Norwegian historiography and representations of history and that is to make the case for the quite pan-European desire for colonies in the period — even in countries that never attained colonies. Uncovering and highlighting that such desire was also the case for Norway (as it was also for Sweden and Denmark) may challenge not only some of the historiography of these Nordic countries, including Norway, but also contribute to a more nuanced history of European colonial expansion and its localities. Kirsten Alsaker Kjerland is a historian with UiB Global at the University of Bergen. Beginning in 1999, she was part of a team of historians writing a history of Norwegian development aid, published in three volumes in 2003. She initiated the research project “In the Wake of Colonialism” and is the author of Nordmenn i det koloniale Kenya (Spartacus, 2010) and co-editor, with Knut Mikjel Rio, of Kolonitid: Nordmenn på eventyr og big business i Afrika og Stillehavet (Scandinavian Academic Press, 2009). Bjørn Enge Bertelsen is Associate Professor in the Department of Social Anthropology at the University of Bergen. His articles have appeared in Journal of Southern African Studies, Social Analysis, Anthropology Today, and Urban Studies. He is the author of Violent Becomings: State Formation, Culture and Power in Mozambique (Berghahn Books, 2015) and co-editor of Crisis of the State: War and Social Upheaval with Bruce Kapferer (Berghahn Books, 2009).